For a long time, my only knowledge of the game was through the MikroBITTI magazine, which published a review of the game in June, 1987. 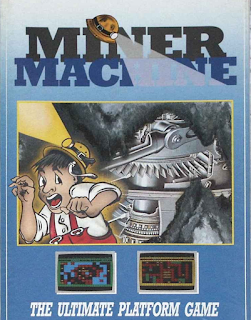 Only long after emulation had become a popular thing, I had my first go at Miner Machine, which I remember having felt a bit underwhelming at the time. But my experience with the MSX was very limited at the time, and I hadn't really put any notice on the fact that the game actually remains the only MSX title that has managed to sneak its way to be published in other countries, albeit through questionable methods, so there must be something exceptional about this title. As the story goes, apparently a French publishing house named Eaglesoft had somehow managed to get the game through whatever channels, and published it without ever contacting the game's developers and asking for a permission. In Spain, System 4 took the Eaglesoft release and published it with slightly altered cover art. Finally, it was featured in a compilation called 30 MSX Hits from Premium III. So, although it was surprisingly widely distributed in Europe, Weckroth and Savolainen have never gotten any royalties for their product from the European sales. 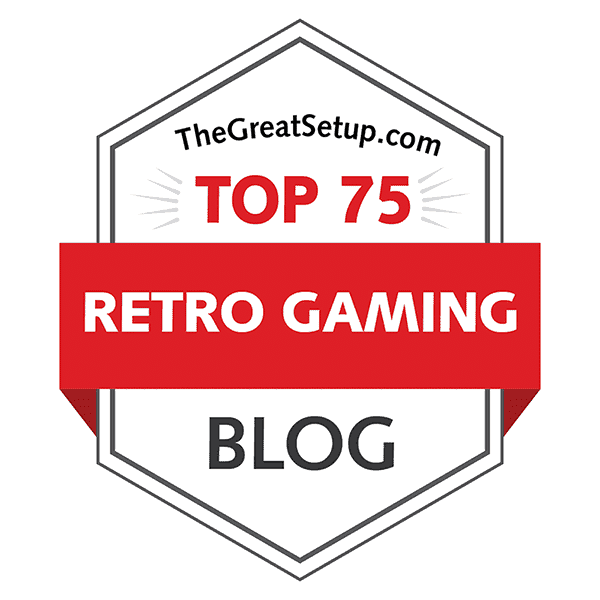 Having said as much, a low-budget retrogamer such as myself has to be grateful for this wider, but unauthorized European release, because otherwise, we wouldn't necessarily be able to play it on emulators, because the original Finnish release is so rare, that it's practically impossible to get a hold of it through any normal channels - which is why I had to feature the rather dubious Eaglesoft cover as the title picture here. Miner Machine looks like another Boulder Dash variant, which is a bit unfortunate considering that I already dealt with one such title this month already. In this case, though, some gameplay elements from Boulder Dash are combined with those from Pengo, if that rings a bell. Basically, the idea is to remove dirt to open up passages, collect gold bricks and avoid or destroy enemies by slinging the vacant rocks at them. As with BoneCruncher, the element of gravity has been removed from Miner Machine. 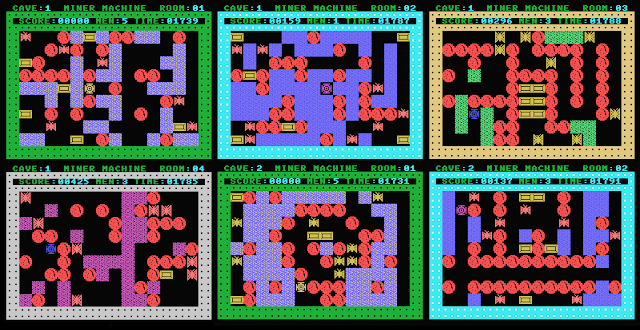 There are two difficulty levels (or caves), each of which contain 25 rooms to clear. It's all fairly simple and effective, and as a bonus, you even get a room editor for the same load. But what about the game status, then? It's not all that widely regarded as a particularly notable game, with only 2 stars out of 5 from only 3 votes at Generation-MSX, but at the time of release, it was pretty much the best in arcade-action you were able to get for the MSX that was made in Finland, so it has somewhat of a cult classic status here. The game starts off simply enough, by giving you a choice of caves - which unhappily aren't indicated, so if you don't have the original game with its instructions (assuming there are any), you have no option but to guess how many caves are there. It turns out, there are only two caves to choose from, and for choosing either one, you must input "1" or "2" from your keyboard. Well, it's not much of a problem, but it would have been nice to have an icon-based selection screen instead, since there are only two to choose from. Actually, that's not completely true, since you can also choose "0" (zero), which launches a room editor, which empties all the level data once you launch it. But let's talk about that a bit later on, and focus on the game itself for now. Happily, the title screen gives you a wrong impression on the room sizes, although it's a bit of a pity that all the rooms are of the same size - a 9x14 grid, to be specific. All the rooms feature same elements: dirt blocks, spherical rocks, gold bricks (or ingots, if you prefer), and bats, which are the game's only dangerous element. Since there is no gravity in Miner Machine, the method of disposing of your enemies is to push rocks at them. Pushing the fire button and your chosen direction simultaneously will make the Miner Machine to nudge one of its four appendi, and if a rock happens to vacate the space immediately next to you in your chosen direction, the nudge will make you basically lunge the rock into that direction as far as it is able to go - anything but a blank space will break its journey, and if it hits an enemy, the enemy will die from the collision. By default, the bats will move around empty areas in four possible patterns, unless their immediate path is somehow altered by your actions. Since there is no option to create more gold bricks by killing enemies, like in Boulder Dash, the only option is to collect all the initially available ones and move on to your best ability. There is also a time limit to clear a room, but in Miner Machine, running out of time results in an instant Game Over, which is a bit unfair, because you can easily get trapped in an impossible situation by accident. Thankfully, the MSX keyboard features a STOP button, which acts as a suicide button, so you might have another chance. In at least the blueMSX emulator, you can find the STOP button placed under the Page Up key. One problem I should probably mention, which I'm guessing has a lot to do with emulation. I haven't been able to test the game on real hardware, since I can currently only use cartridges on my MSX, but in both openMSX and blueMSX, the game seems to have some trouble receiving keyboard commands, which makes it difficult to perform quick maneouvres with any certainty. It could also be that the game acts this way on a real MSX as well, but for now, I have no idea. Comments on this would be appreciated. Now, the room editor is fairly simple to use. You start off with an empty grid, a cursor and three indicators at the top, which tell you the room number you're currently editing, the cave number it will inhabit, and the way the bats will move in the room. These three indicators you can change by their letters: C for Cave number, B for Bats way and R for Room number. You can place the items around in the room with the cursor, and pressing one of these keys: M for the Miner Machine, 1 for a boulder, 2 for a gold brick, 3 for dirt, and 4 for a bat. The Space Bar acts as an eraser. I'm not entirely sure about this, but it seems you need to push ENTER in order to save the room into memory, before you are able to actually play your newly designed room. Saving your own designs to tape can be done by pushing the S key, and loading your designs from tape happens by pushing the L key. The Spanish tape inlay scan available at the videogames.fi page of the game tells us (more or less?) that in order to get to load or save anything (in other words, to start the tape recorder), you need to press the 0 (zero) key. However, since my understanding of Spanish is next to nothing, I translated these instructions with Google Translate, so the translation is no less than questionable. Comments on this would be appreciated as well. To get back to the title screen, push the ESC key. And that's all there is to it, really. The only thing I have yet to mention is that you have to press Space in the title screen in order to get to the cave selection screen. Not right away, though - you need to wait for a few second for the program to be able to receive that command while the music plays. But otherwise, it's as simple as I've written here, yet the game does have a fairly high level of difficulty, probably to make up for the lack of levels and variation in enemies. Luckily for me, but unfortunately for the game, there isn't much of graphics to speak of here, since only the in-game elements are accountable as graphics. Even the title screen only consists of a small area depicting all the game elements in addition to the obligatory title text, which is very basic. It should be noted, that the original Finnish version says "Copyright (C) 1986 by Mika Savolainen" instead of 1987 Eaglesoft. I guess copyright laws were really loose at the time. Well, that's beside the point now. At least the colouring changes by the room colour you have previously visited. It serves its purpose, but that's all I can say about it, really. Variations of all the graphical elements in the game. There are three things that always remain the same: boulders, gold bricks and bats, and only the bats are animated. Their animation is rather simple, though - two frames in two colours. I have no idea how many colour variations are there in Miner Machine, since I have only managed to get to room 5 in cave 1 so far, but at least there are some, so playing through the game gives something more to look forward to than just new puzzles. In the above picture, I also included all four of the Miner Machine's boulder-pushing poses; there are no actual animations involved in these. Cave colouring variations from the first four rooms of cave 1, and the first two rooms of cave 2. Anyway, it's not as though the game starts looking particularly different with the colour changes - indeed, it took me a while to even properly notice it, because figuring out the puzzles takes precedence over the subtle variety in graphics. The only things that change in colour are the dirt bits, the borders and the Miner Machine itself. In both pre-designed caves, the colouring order is the same, so once you have completed the first cave, the only excitement about the second cave is what sort of puzzles await you there. Editing a new room. Left: new, empty room. Middle: a new, finished room in editor. Right: the new custom room in game. For the room editor, the creators added another graphic element: a cursor. Instead of the obvious rectangle, as it is in Boulder Dash Construction Kit, we get a cross-hair sort of a thing, which is a nice personal touch. The only other visual difference to the actual in-game layout is the info panel, which doesn't invade and stretch the north wall. I have to say, I'm rarely astounded by the quality of MSX game graphics. 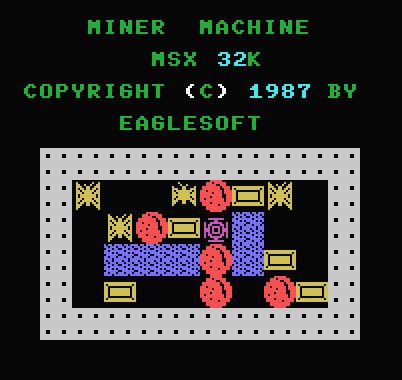 Still, for Miner Machine, a word like mediocre could probably be counted as a compliment, because there isn't anything particularly impressive about its graphics. I could call them functional and clear, though, which should be considered a good thing. For the amount of data the game has to contain in all its 50 puzzle rooms and the ability to make your own rooms as well, the lack of graphical finesse is understandable, and most likely even preferable, because the level of smoothness in gameplay is already verging on being dangerously off-balanced, likely due to relatively basic game code. One would have to understand coding to be able to appreciate what is happening in this game, and more to the point, what isn't. Unfortunately, I do not possess that luxurious ability. As much as in terms of graphics, Miner Machine is similarly simplistic in sounds. It has a theme tune, which is reminiscent of some of Bach's piano etydes, but since it only has one channel in use for the chord arpeggios, which construct the single melodic line, it's quite difficult to place the melody anywhere specific. It is entirely possible, that the melody is original work from Weckroth or Savolainen, but I doubt it, since the harmonic structure is very Bach-like. In addition to the main theme tune, there is no music, but I counted five different sound effects in the game, all of which feel like they could have been copied from some version of Boulder Dash. You get a short white noise-like sound for clearing a bit of dirt, one type of crash sound for a boulder to hit something, another type of crash sound for when you die, a nice bright cling-sound for when you pick up a gold brick, and the ringing of spare time being added into your total score. The room editor doesn't have any sounds, so this is all you're going to get here. Once again: serves its purpose, but not really more than that. 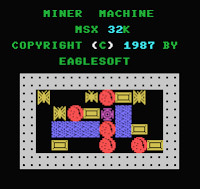 There were several nice little commercial titles released for the MSX in Finland, so one can only wonder: how is it that Miner Machine was the only one that found its way to Central Europe? Through a stroke of (bad) luck, the game has become the most famous Finnish MSX title of all time, because it was published in other regions without the authors' permission. I'm not sure if we, as a nation, should be more grateful than offended for this, but at least a small amount of archaeology can clearly point out that it was not all just Commodores for us here in the 80's. On that note, it won't be surprising that the next item in this series will be another C64 game, but you'll have to wait for that one another month or so. But, that's it for now, see you next time!